R and I decided to waste an evening on the streets of Pune. Now why the streets of Pune are so awesome is that there will never be any shortage of food. Never. Fits any pocket size/ stomach(or both, as is the case with us). Much like our ancestors ad infinitum, with stomachs growling, R spoke, "Me hungry. Want food." Off the two hunters went in search of good food. Now the problem with FC road is that we've exhausted all possible eating outlets. Really, all. place to eat, even if the exterior and interior kind of don't match. The inside of the place reminded me of the kind of restaurant setups that we saw in 1990s Hindi films. Santoor music playing, booths and chairs, you know what I mean? First off, one look at the menu, we realized although choices were not very many, it WAS to us, because we had never sampled any of it before. On this note, the servers were quite helpful, pointing out what would be good for beginners, and not just pointing out the most expensive items on the menu, as is the case with Piccadilly in Mumbai. What a rip-off that was. That story will also come sweet readers! We got off the mark with a one-by-two glass of Kokum (which I interpret as the Sanskrit of Coke. Sorry, you'll get used to my humour in a bit! ), a plate of Bhakri, two bajra rotis, dahi vada, mutton rassa (rassa is curry in Marathi language) and a dessert called Lapshi. First, the kokum. Oh my god I promise I haven't had something that refreshing since the time I came from Delhi! It looked like a glass of Rooh Afza but tasted sweet and mostly sour. Now I adore sour stuff. Why R and I ordered one by two is because I knew that kokum has the reputation of being sour, and not having tried it before, I didn't want both of us to go about lemon-faced the whole evening. Now, the Dahi Vada. Honestly, nothing compared to Wadeshwar. The dahi according to R was of good quality, but not what dahi vada requires. 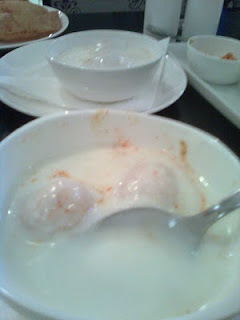 The vada-s themselves were hard, that's breaking the thumb rule when it comes to dahi vada. The vada-s must ALWAYS soft and spongy so as to absorb the dahi when broken into. These literally had to be "broken into". Then the Bhakri. Now close your eyes, and imagine what if a bhatura and a doughnut had a baby. 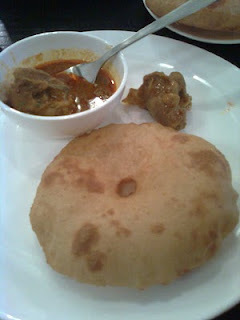 That's what a bhakri looks like- a bhatura with a pinched hole in the centre. Although here I have to say, even though the menu states that bhakri is made without oil, my fingers would beg to disagree. The mutton rassa was very good, definitely the highlight of the evening. The gravy was albeit a bit oily, but R who is the mutton guru, nearly raptured "bellisimo!" on eating the mutton. Very soft, extremely good quality, and sizable chunks. Bit on the spicy side, but if you can take it, nothing better. tasted very nice with bhakri and rotis. The rotis were dense but fluffy, a near oxymoron. Served very hot, they also tasted really, honestly really good with the rassa. Now, for the dessert, Lapshi. This I knew was a very famous traditional Marathi sweet dish. 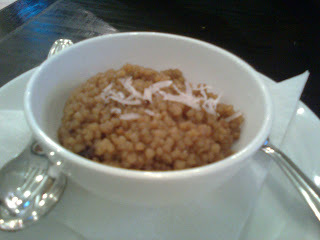 It's made of broken wheat or dalia, jaggery, milk and coconut. My thing is that I like to eat anything which has to do with whole grains. I don't mean I'm a health nut who eats whole foods only. I mean that anything to do with dal (like pakodas), wheat, oats etc is automatically my favourite, simply for the texture it gives. What was not quite right with this dish is something I can't put my finger on. I won't say it was too sweet, sweetness is an objective factor, it's never wrong or right. The texture itself, on the dry side wasn't too bad. I don't quite know why neither R nor I liked it. The gur may not have been of top notch quality, there was an odd smell of husk in it. The bill came out to be 300-something, which isn't bad for how much we ate. The quantity was alright, nothing to write home about, nor anything to complain about. You can go eat there, if you're in the area and you haven't tried Marathi food before. Sarvari though, on the same road is a better albeit more expensive experience. I would give 96K 3/5 chicken legs. That's my unit of liking! Question: Does this place have the typical Maharashtrian snacks - piyush or kothambiranchi wadi, etc? Thanks for going through my blog!